Carl, Riley, Stacey, Abby and I have been busy in the shop. We have been busy, busy, busy. We have been cleaning, moving and organizing while doing some new things. Of course, as soon as we clean up Carl’s space he has to go re-arrange and make it his, which looks a bit messy all the time. Abby and Stacey have been learning to turn pens on a lathe we bought a couple of years ago. Here are some of the ones they created. During the fall we also created a garden cart for a good friend Blake Kirby. We gave it to him on the weekend we went to the Good of the Land Festival. Here is a picture of the cart and Blake and I at the festival. You can find Blake at his youtube channel http://www.youtube.com/user/daddykirbs or facebook facebook.com/daddykirbsfarm. You can find us all hanging out and discussing life and our life stories on the Daddy Kirbs Fanily Group. You can join us by going to the facebook page and answering the questions http://www.facebook.com/groups/2024948944400691. Stacey and I have been trying our hand at creating different things. Carl always has to inspect or work. This is a couple of coffee scoops we tried for the first time. This is a work in progress. Tim has worked on making a few rings this winter for some very special friends. Then we have a one of a kind really big project going on this winter. This project should have been a day or two to complete but ended up being a big design project. This is the pictures from the project. This is a massive toy box seat that we created. We have created smaller versions of something similar, but this is by far the largest one we have built so far. This is where we started with some less than desirable plywood. Here it is starting to take some shape, but it needs some support. So we are working on making it a skeleton. Ok, the plywood just wasn’t working. So fence pickets to the rescue. Experimenting with the back to make it something else. This is one of the many trials we had with this piece. Thinking this might have to be an Optimus Prime piece yet!! Carl’s inspection. Not sure if he is ok with it or not. We have moved it so much he has thumped it several times in frustration. Carl is more chilled out about this whole project today. It hasn’t moved yet today. Carl decides the Optimus Prime look has to go. The rounded back is more clean looking and safer. The finished product! The hinges are made by me, and the fence pickets are much better than the plywood. This is all the storage space being provided. This is a toy box for a very special baby boy. It has been interesting working on this project. It is much larger than anything we have built in a long time. I report there was one injury that was caught on camera. However, Carl made a full report. Other projects that have been completed this winter so far. Stacey has been practicing her turning and is using firewood to make items, just because it is free. These are firewood mallets she made for the kitchen and shop. Carl has a few new tricks. He likes to be the Office Manager when he can. He has taken over the office chair in the shop. Carl is also helping Stacey with her gardening projects. She has planted him a few strawberry plants in one of her Gardenstalk systems. Then the shop has become grow light central for all the seed starting because she has designated 4 garden spots in our yard to plant vegetables, fruits and flowers. Carl says it is time for snacks and then a nap. So here he is after his long day of inspecting all the work on projects. What’s Happening in My Shop Carl’s Rules? HOWDY Y’all. My name is Tim and my shop manager is Carl. Carl is a rabbit. He lives in my shop except when my daughter is showing him. Carl is a Fawn Flemish Giant. He is the ruler of the shop and safety manager. Carl is all about the safety of my wood shop. He is very independent unless I have treats (AKA Carrots). Then he likes me. Carl was won in an Auction in the rabbit show community for a dear friend whose mother has cancer and needed help paying for treatments. Carl has been the best auction item ever won! He is great company and keeps me on my toes as he likes to lick them. Over the last week, Carl and I have been tasked with building bed frames for the rental cabin. With help we spent a day planing culled lumber, and cutting lengths for the beds. Finally yesterday we got it together in the cabin for use. This is the frame before it we added the mattress and bedding. The finish will come later after it has time to get a little abuse and will look more rustic. This way it will acclimate to the rest of the cabin. Carl and I are planning many more wood working projects and would like to post them here for you to see. Carl and I have lots of stories of memories and family to come. This page will be about Carl, wood working projects he (my wife) gets us into. He listens to her better than I do. So he tells me how to make it the way she wants. Also, we would like to tell you about Rabbits and how they can be great companions too. (Much better than a cat and cleaner than a dog) Just kidding we have all sorts of animals. My wife has wild kingdom! So until the next post Carl is listening for the next instruction on projects. 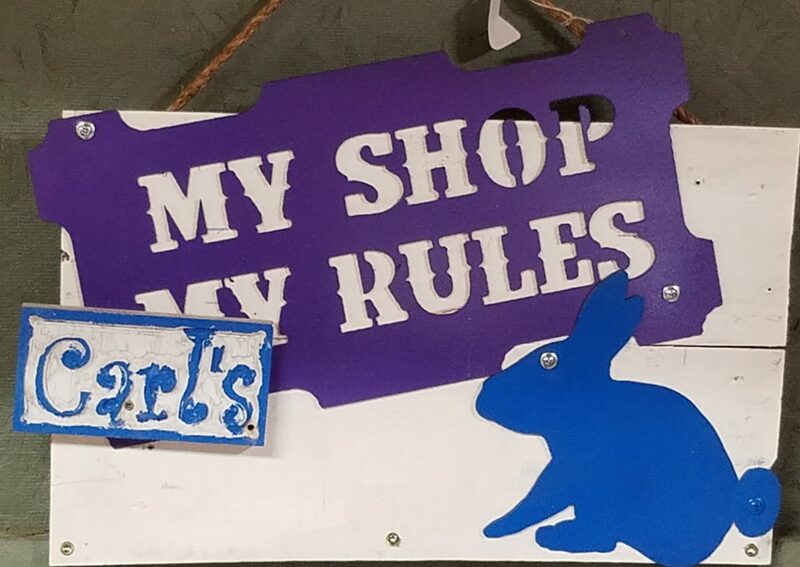 Author myshopcarlsrulesPosted on October 3, 2017 Categories Carl's Report1 Comment on What’s Happening in My Shop Carl’s Rules?